Whitney Cant joined the Library staff in 2017. Her favourite part of her role is connecting with patrons and loves helping a reader find their next great book. 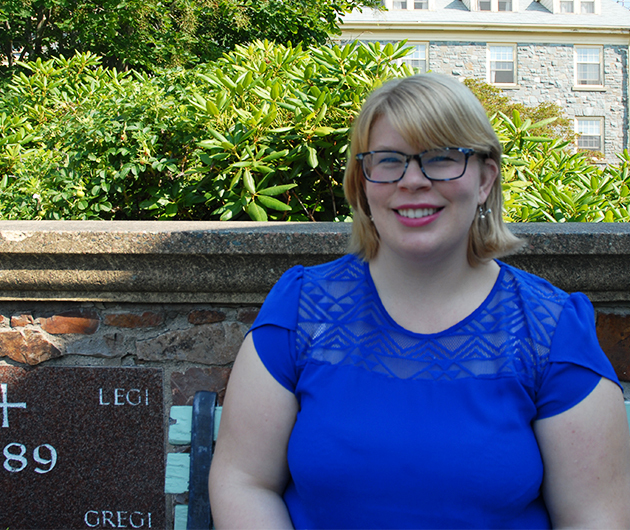 Born and raised in Halifax, Whitney graduated from King’s in 2012 with a BA in English with a Minor in Film Studies. Throughout her degree she was a frequent visitor to the King’s Library, and has always loved the cozy and welcoming atmosphere to be found there, especially in her favourite armchair. Whitney originally planned on a career in Film Studies, and earned an MA in Film Studies from the University of British Columbia in 2014. In 2016 she changed directions and began pursuing a career in libraries, which she has since discovered is her true passion. When she’s not reading Whitney enjoys crossfit, knitting, and attending local events and festivals. She is a regular volunteer at Hal-Con Sci-Fi Fantasy and Comic Convention and loves to share her nerdy side. Whitney has never given up hope of receiving her letter from Hogwarts.